Diabetes can harm your eyes. It can damage the small blood vessels in your retina, or the back of your eye. This is called diabetic retinopathy. Diabetes also increases your risk of glaucoma and other eye problems. You may not know your eyes are harmed until the problem is very bad. Your doctor can catch problems early if you get regular eye exams. You need an eye exam every 1-2 years by an eye doctor who takes care of people with diabetes. If you have eye problems because of diabetes, you will probably see your eye doctor more often. Sometimes, your doctor may tell you to come less often. What Is a Dilated Retinal Exam? 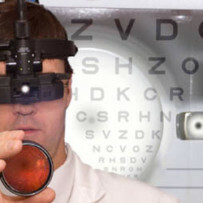 The doctor will check your vision using a chart of random letters of different sizes. This is called the Snellen chart. You will then be given eye drops so that the doctor can better see the back of the eye. You may feel a slight stinging sensation when they are first placed. Another device called a slit lamp is used to see the clear surface of the eye (cornea). If you had drops to dilate your eyes, your vision will be blurred for about 6 hours. It will be harder to focus on things that are near. Sunlight can damage your eye. Wear dark glasses or shade your eyes until the drops wear off.